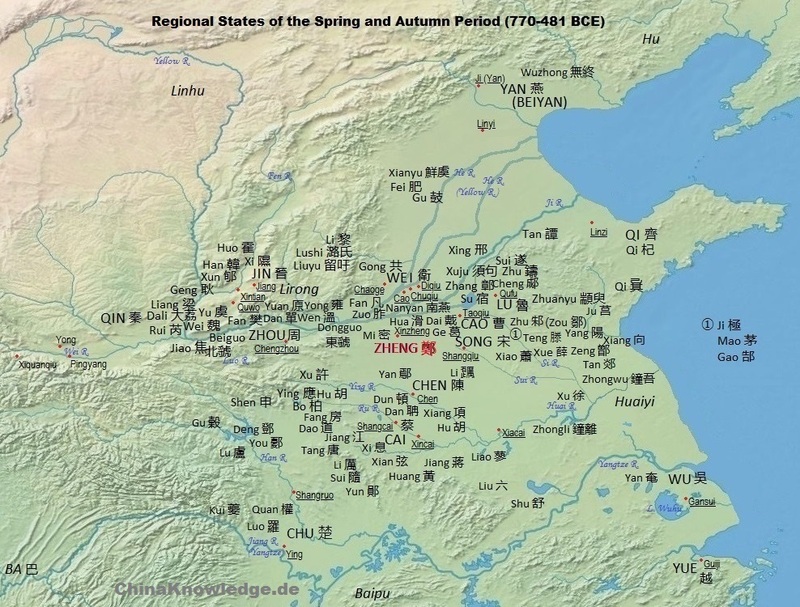 The state of Zheng 鄭 was a regional state of the Zhou period 周 (11th cent.-221 BCE). As a small state of the Central Plain, it had always to cope with the ambitions of the larger states around. The territory of Zheng was located in the southern parts of the modern province of Henan. Map according to Tan Qixiang 谭其骧 (1987), Zhongguo lishi ditu ji 中国历史地图集. Zheng was located in the Yellow River Plain. It was relatively strong among the smaller regional states, but was conquered by Han, one of the newcomers of the early Warring States period. Click to enlarge. The first ruler of Zheng was Duke Huan 鄭桓公 (r. 806-771), a minor son of King Li of Zhou 周厲王 (r. 878-841) and a brother of King Xuan 周宣王 (r. 827-782). The state of Zheng was originally located near the capital of the Zhou empire, Feng 豐 (or Zongzhou 宗周, near modern Xi'an 西安, Shaanxi), eastwards of modern Huaxian 華縣, Shaanxi. When the Western Capital of the Zhou dynasty was attacked by the tribes of the Quanrong 犬戎 (Xianyun 玁狁), Duke Huan was killed, at the side of King You 周幽王 (r. 781-770). His son, Duke Wu 鄭武公 (r. 770-744), was able to secure the Central Plain for the Zhou dynasty, and supported King Ping 周平王 (r. 770-720) in the establishment of the Eastern Zhou dynasty 東周 (770-221 BCE) in the secondary Eastern Capital Chengzhou 成周 (modern Luoyang 洛陽, Henan). Fortunately enough, Duke Huan had somewhat earlier removed his seat of government eastwards into the region between the regional states of Guo 虢 and Hui 會 (also called Kuai 鄶 or Hui 檜; modern Xingyang 滎陽 and Xinzheng 新鄭, Henan). Duke Wu had two sons, Duke Zhuang 鄭莊公 (r. 743-701), and Prince Duan 段. The Duke made Prince Duan ruler of Jing 京, the capital of Zheng, a step for which the Duke was criticized, and indeed, Prince Duan started a rebellion. His mother was banished from the court, but Duke Zhuang soon repented and visited her in her mansion. In 720, Prince Feng 馮 of the state of Song 宋 fled to Zheng, a circumstance for which Song and Wei 衛 would attack Zheng a year later. Zheng had, on its side, attacked the kingdom of Zhou and occupied a small part of its territory. King Huan of Zhou 周桓王 (r. 719-697) ordered the states of Chen 陳, Cai 蔡, Guo, and Wei to attack Zheng, but the royal army was defeated, and the King suffered an injury. This event was a true sign that the kings of Zhou had practically lost their function as the highest sovereign of China. Duke Zhuang of Zheng is therefore often called a forerunner of the hegemonial lords (ba 霸) of the Spring and Autumn period 春秋 (770 - 5th cent. BCE). He had demonstrated his political and military power by attacking Chen and the smaller regional states of Xu 許 and Xi 息. Duke Zhuang also introduced the political method of concluding peace by exchanging princes as hostages, in his case with the royal house of Zhou. In 706, Zheng supported the state of Qi 齊 against the northern Rong tribes 北戎. Prince Hu 忽 was rewarded for this military support with a princess from Qi. When Duke Zhuang died, chief minister Ji Zhong 祭仲 wanted to make Prince Hu the new ruler. But the duke of Song, a relative of the mother of Prince Tu 突, wanted the latter to be ruler of Zheng, and Ji Zhong was forced to concede. Prince Tu thus became duke of Zheng (posthumously known as Duke Li 鄭厲公, r. 700-697), while Prince Hu went into exile in Wei. Yet Ji Zhong reigned for Duke Li, a matter which caused Yong Jiu 雍糾, the Duke's grand-father in Qi, to plan the murder of Ji Zhong, yet his daughter reveiled the plan, and Ji Zhong in turn killed Yong Jiu. Duke Li thereupon renounced, and Prince Hu was welcomed as ruler of Zheng (posthumously known as Duke Zhao 鄭昭公, r. 696-695), while Prince Tu stayed in Li 櫟. A high official, Gao Qumi 高渠彌, killed Duke Zhao during a hunt. Nobody dared to welcome Prince Tu to mount the throne, but the younger brother of the two princes, Prince Ziwei 子亹, was installed as lord of Zheng. During a conference of the regional rulers (zhuhou 諸侯), the duke of Qi was enraged about Lord Ziwei, because he did not exhibit the right etiquette, and had him killed. Gao Qumi escaped, and together with Ji Zhong, they installed Ziwei's youngest brother, a child of minor age, as a ruler (r. 693-680), called "the (nameless) Viscount of Zheng" 鄭子. The death of Ji Zhong provided an opportunity for Prince Tu to attract the nobles to his cause. The Viscount was killed, and prince Tu was received back as duke of Zheng. Duke Li (Prince Tu) supported King Hui of Zhou 周惠王 (r. 676-652) in his fight against his brother, Prince Tui 頹. Together with the lord of Guo, Duke Li killed Prince Tui and escorted King Hui back to Luoyang. Duke Wen 鄭文公 (r. 672-628) did not treat Prince Chong'er 重耳 of Jin 晉 with the appropriate etiquette. He furthermore occupied the statelet of Hua 滑, which was allied with Jin. King Xiang of Zhou 周襄王 (r. 651-619) dispatched an envoy to express his regret. Angry that the King's father, King Hui, had not rewarded the Duke's father for his support, arrested the envoy. The King, on his side, thereupon personally led a campaign against Zheng, so that Duke Wen gave in. In 632, Zheng asked the state of Chu 楚 for support during a campaign against Jin. The ruler of Jin, Duke Wen 晉文公 (r. 636-628), the former Prince Chong'er, took revenge two years later and made war against Zheng, with the support of the state of Qin 秦 in the west. One member of his corps was Prince Lan 蘭, a son of Duke Wen of Zheng. The Duke had chased away all his remaining sons after five of them had rebelled against their father. Prince Lan had fled to Jin, where he was treated with great honours. During the campaign, he wanted to become the heir of Duke Wen, and therefore it would be necessary to kill Prince Shu Zhan 叔詹, a brother of the Duke. Prince Shu Zhan knew this, and to avoid disaster for the state of Zheng, he killed himself. Duke Wen of Jin wanted to glory in his victory and tried to humiliate his enemy, King Wen of Zheng. But the troops of Qin withdrew for fear that Jin might gain too much power with this military success. Prince Lan was, nevertheless, accepted as the heir of Duke Wen. He mounted the throne and is known posthumously as Duke Mu 鄭穆公 (also called Miu 鄭繆公, r. 627-606). During the reign of Duke Mu, Zheng joined with Jin for a succesful campaign against the state of Qin. Duke Ling 鄭靈公 (r. 605), his son, was killed by the Princes Guisheng 歸生 (Zijia 子家) and Song 宋 (Zigong 子公) after a quite ridiculous incident: Zijia's index finger (Chinese: shizhi 食指 "eating finger") trembled, which he saw as an omen that they would be banqueted with something extraordinarily delicate. They were, indeed, presented a soup cooked with a precious turtle presented by an envoy from Chu. When they laughed and told the Duke about this strange happening, he became angry and wanted to kill them for this flagrancy, but the two were faster and killed the Duke. His son Prince Jian 堅 mounted the throne. His is posthumously known as Duke Xiang 鄭襄公 (r. 604-587). The murderer's families were exiled. During the reign of Duke Xiang, there was war with Chu, but an alliance with Jin made things easier in the beginning. The provocation to the war against Zheng was that during a former war with the state of Song, an ally of Chu, general Hua Yuan 華元, who led the troops of Song, had been captured by Zheng and was only released after Song had paid a high ransom. Chu later managed to force Zheng into submission. The relief troops from Jin only arrived after Duke Xiang had humiliated himself before the king of Chu. The troops of Zheng, in this situation, sided with the victor, Chu. The alliance with Jin was broken. During the reign of Duke Dao 鄭悼公 (r. 586-585), Duke Ling of Xu 鄦靈公 (Xu is normally written 許, r. 591-547) tried to discredit the duke of Zheng. Duke Xiang therefore dispatched Prince Gun 睔 to Chu to express the loyality of Zheng to Chu, but the Prince was arrested. Duke Dao thereupon thought about a harmonisation with Jin, but in the meantime, a prince of Chu helped Prince Gun getting free. In the ensuing campaign of Chu against Zheng, the latter was supported by Jin. Prince Gun was enthroned as Duke Cheng 鄭成公 (r. 584-571). When he visited the Duke of Jin, the latter accused Duke Cheng of treachery because he had made a secret agreement with Chu. The Duke was arrested, and general Luan Shu 欒書 attacked the orphaned state of Zheng. In that situation, Prince Xu 繻 was made temporary ruler of Zheng. Jin thereupon released Duke Gong, and Lord Xu was killed by the nobles of Zheng. In 575, Jin attacked Zheng again because it had approached Chu in an open alliance. Jin and Chu met in battle at Yanling 鄢陵, and the King of Chu was injured. The capital of Zheng was successfully defended against Jin. Duke Xi 鄭釐公 (r. 570-566) was poisoned by the chief minister Prince Zisi 子駟. Prince Zisi, inspite of his cruelty against his relative, managed to keep a balance between the mighty states of Jin in the north and Chu in the south. Only when he tried to dethrone Duke Jian 鄭簡公 (r. 565-530) and to become ruler himself, he was killed by Prince Zikong 子孔. Prince Zikong himself wanted to mount the throne, but he was advised by Prince Zichan 子產, a son of Duke Cheng, not to do so. Instead, he acted as chief minister, but because he usurped too much power, he was executed by the Duke, and Prince Zichan took over the post of chief minister. Zichan was a very competent person and was known for his kindheartedness, which helped him to survive the mutual slaughter of the princes of Zheng. The state of Zheng was located in a strategic position that not only allowed it to function as a hub for trade from east to west and north to south, but which also made Zheng a militarily important place though which all armies had to march through to reach territories of their enemies. With its relatively strong army Zheng participated in important campaigns of the larger states in its neighbourhood. Zichan had an important role in reforming the legal, land and tax systems of the state of Zheng, so that it was able to built up a large army and to survive the beginnings of the Warring States period 戰國 (5th cent.-221 BCE). King Ping of Chu 楚平王 (r. 528-516) gave back a stretch of land of Zheng which Chu had occupied before. The reason for this was that King Ping had mounted the throne as a usurper and so wanted to appease eventual critics. The house of Jin meanwhile fell into disorder, and the lords of Han 韓, Wei 魏, and Zhao 趙 rose to power. Zichan, with his eminent prestige, admonished the earl of Han to exert a benevolent government. During a fireblaze that devastated large areas of Zheng, Duke Ding 鄭定公 (r. 529-514) wanted to carry out sacrifices in order to appease the spirits, but Zichan admonished him and said that it would be better to exhibit benevolence and righteousness as a ruler, i.e. to care for the people, to feed them, and give them shelter. In 520, Prince Jian 建 of Chu, who had fled to Zheng, was killed because he had secret relations with Jin and planned to attack Zheng. A year later, Jin and Zheng supported King Jing of Zhou 周敬王 (r. 519-476) against the rebellious princes of Zhou. In the next two generations, Zheng became weak and was not more than a ball in the games of the new political powers Han and Wei. When Zichan died, under the rule of Duke Sheng 鄭聲公 (r. 500-463), the whole country was in mourning. Even Confucius 孔子 had been an admirer of Zichan as a practical politician with the right sense for moral issues. In 493, Duke Sheng supported the earls of Fan 范 and Zhonghang 中行 against the state of Jin. Jin took revenge and defeated the army of Zheng. In 464, the viscount of Zhi 知 conquered nine towns of Zheng. Duke Sheng's son, Duke Ai 鄭哀公 (r. 462-455) was assassinated and replaced by his uncle Prince Chou 丑, known posthumously as Duke Gong 鄭共公 (r. 455-424). His successor, Duke You 鄭幽公 (r. 423), was killed by Viscount Wu of Han 韓武子 (r. 424-409). During the reign of Duke Xu 鄭繻公 (r. 422-396), Han occupied the residence of Zheng in Yongqiu 雍丘, which then had to be shifted to Jing 京. Nevertheless, Zheng was still able to defeat the armies of Han two times in the next decade. When Duke Xu killed his chief minister Ziyang 子陽, he met his fate and was assassinated. The last ruler was Prince Yi 乙 (also known as Duke Kang 鄭康公, r. 395-375), a younger brother of the dukes You and Xu. In 375, Han occupied Zheng and destroyed the ruling house. Yi, Viscount of Zheng 鄭子儀 Ji Yi 姬儀 679-673 ? (Zheng Aigong 鄭哀公) Ji Yi 姬易 462-424 ? Shiji 史記, 42, Zheng shijia 鄭世家. Luo Shilie 羅世烈 (1992). "Zheng 鄭", in Zhongguo da baike quanshu 中國大百科全書, Zhongguo lishi 中國歷史 (Beijing/Shanghai: Zhongguo da baike quanshu chubanshe), Vol. 3, 1523.